Hello everyone, sorry to be Mrs Grumps, but a little word about challenge rules. Day five of this months challenge and we are thrilled to see so many of you joining in the fun.................but please do check the rules before you link up your work..........they are on the sidebar, at the top of the blog and above Mr Linky. I know most of you do abide by the rules, but sadly some of you don't, which spoils the fun for all of us. And even if you have six entries or less when you enter and the DT have visited you, that does not mean will not check back to see if more challenges have been added.............yes, some peeps really do that. So there is no misunderstanding, you can combine your Stampalot entry with a max of five others.............that means six in total. Any breaking that rule will just be marked ineligible and not be in the voting for the prize at the end of the month. It takes the DT a lot of time to visit your entries and they love doing it, but they do get a bit miffed wasting their time visiting those folks who don't bother to check their entry is eligible, when they could be commenting on those who do play by the rules. 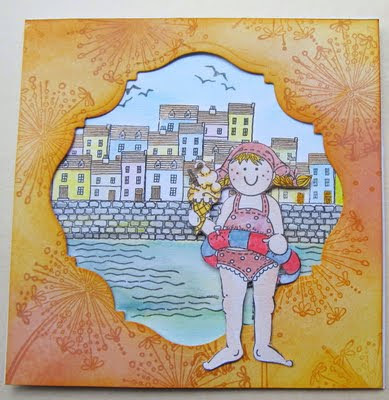 As you will see from the super inspiration the DT have come up with, we are all in Molly mode showing you just how fabulous the new Molly Blooms Summertime Fun collection is, just right for all those Summer creations. You can find them all here at Sir Stampalot waiting to make their way to your craft desk. And as you might expect, this months fabulous prize has several of the new stamps along with lots of other summery crafty goodies to keep the lucky winner occupied for days. Note about our July winner and Top 3: They will be a bit late being posted as I will be on my holibos, so look out for them about 9th August.......but the August challenge will be all scheduled and ready to go on 1st of the month......proving Mr Blogger is playing fair that is. Before you link, have you checked our rules and are you sure your card is eligible for our challenge ?